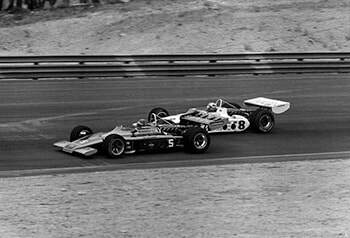 The early 1970s presented a new breed of Indy cars to the USAC Championship trail. 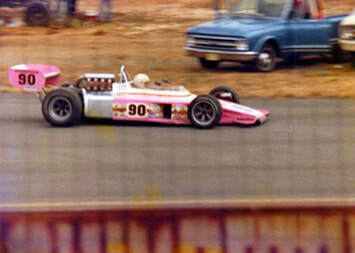 In 1972, Dan Gurney’s All American Racers outfit premiered the 1972 model Eagle chassis at the first race of the year at Phoenix. 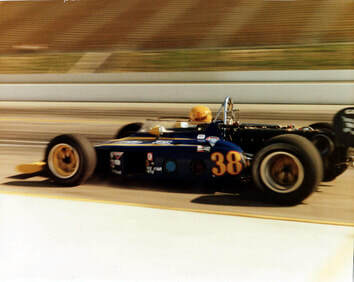 The AAR team, with drivers Bobby Unser and Jerry Grant, would go on to take eight poles and four race wins in the ten race season, showcasing the outright speed of the new car. A total of 29 1972 AAR Eagle chassis were built, and 27 were raced throughout the 1970s and some even into the early 1980s. 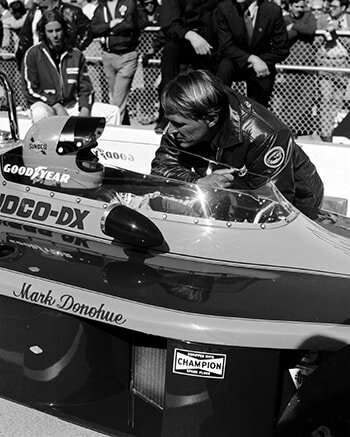 In March 1973, reigning Indy 500 champion Mark Donohue took part in a Goodyear tire test at the Speedway with a new McLaren chassis. The results of the test showed Donohue some seven m.p.h. off the leading cars, mainly Gurney’s team.The decision was made by Donohue and Penske to order one of the AAR customer Eagles, in attempt to try to find an “unfair advantage” with an entirely new car. Long-time Penske crew chief Karl Kainhofer drove out to Gurney’s shop and picked up all the bits of the new chassis, #7225. This was the only car to ever leave the AAR shops unassembled, per the request of Roger Penske. The month of May in 1973 was one to forget for many. Long-time USAC racer Art Pollard, driving the #64 Cobre Tire Eagle, a car built in the same line as the new Penske entry, was killed on May 12, in a horrendous accident in turns one and two.Speeds increased as the month edged towards qualifying, with Donohue reaching 193 m.p.h., some four m.p.h. off of the leading trio of David “Swede” Savage, Bobby Unser, and Johnny Rutherford. On pole day, the Sunoco-DX machine managed to squeak out a four-lap average of 197.412 m.p.h, qualifying third in the traditional 33 car field. 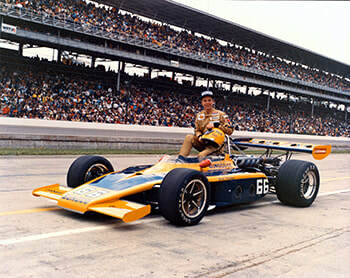 Out of the 17 1972 Eagles in the field, Donohue had managed the quickest time, only bettered by Rutherford’s Team McLaren entry and Bobby Unser’s 1973 model Eagle, a AAR exclusive car that year. The race started out badly when Salt Walther, who started in the 17th position, harpooned into the catch-fencing on the main-straight after contact with another car. The Ohio-native would suffer severe burns, though he would recover to qualify for another five Indianapolis 500 events.On lap 57, Swede Savage’s Patrick Racing Eagle, which had been dicing for the lead, crashed into the turn four infield wall. The enormous wreck sent parts of the car all over the track, while the Santa Ana, California native tried to free himself of the burning wreck. His effort, seen in papers and news highlights around the world, showcased the tenacity of a driver who was on-track for greatness. Sadly, his injuries proved too great for even his willpower; Savage died 33 days later.As the event wore on, rain delays, restarts, and high compression ratios played havoc on the field, claiming Donohue’s Offenhauser power plant on lap 92 with a broken piston. The 1972 champion would receive credit for 15th position. This would be Mark Donohue’s final Indianapolis 500. Two months later, Donohue piloted the car in the Pocono 500. Mark, who had been contemplating retirement from active competition since May, felt the rear of the Eagle swaying at high speeds. He was only able to comfortably qualify in the 23rd position on the second day of qualifying. During the event, a steady race would have the Sunoco-DX car up and into the lead on lap 76, where it stayed for 8 laps. Shortly after half-way, a burned piston sidelined the car. This would be the only event that Eagle #7225 would ever lead. The September 2nd Ontario 500 was the the last run for #7225 with it's original driver. 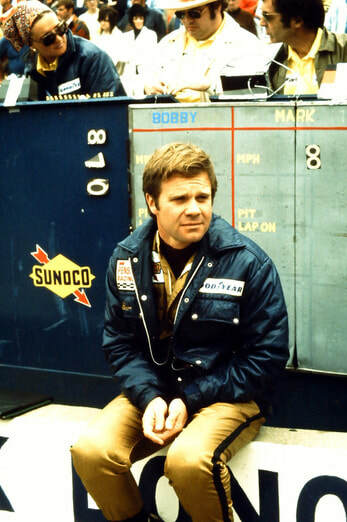 In what was Mark Donohue’s final USAC start, he suffered a broken crankshaft after only 22 laps. 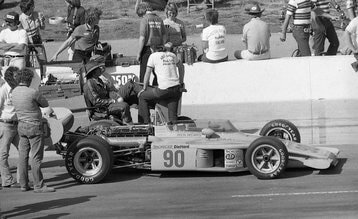 Later in 1973, fellow Penske driver Gary Bettenhausen piloted #7225 in the desert at Phoenix for the season ending 150-mile event. After qualifying fourth, “Gary B” was running strong until he made slight contact with Bobby Unser on lap 40. Unser tore through the turn 2 armco, destroying his 1973 Eagle, and creating such a sight that Al Unser retired from the race, fearing for Bobby’s life. Bettenhausen would go on to finish 6th in the race, a lap down from race-winner Gordon Johncock. 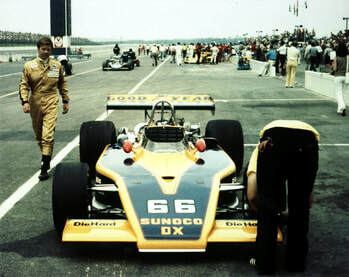 As 1974 came around, the Penske outfit had to do with Donohue’s driving skills, as the versatile mechanical engineer and professional driver decided to manage Penske’s racing efforts. The team also suffered a severe blow, as Peter Revson, who had been signed on to race for the team in the three 500-mile events, was killed in practice for the South African Grand Prix on March 22. #7225 was raced once in 1974 in the hands of Bettenhausen at the March 15 Phoenix 150, where the #8 Penske Products entry was 14th after gearbox failure on lap 79. For the 500-mile events in 1974, a new driver was found in young, personable Mike Hiss to replace Revson. 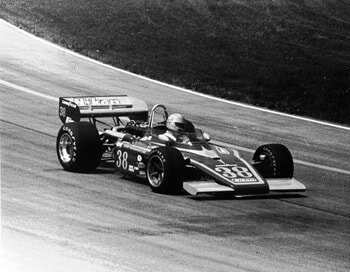 Hiss had placed second for the Penske team at the 1972 Ontario 500 when Donohue was recovering from a broken leg from a Can-Am practice accident at Road Atlanta. During the September 15, 1974 event at Brooklyn, Michigan, #7225 was used as a showcar. 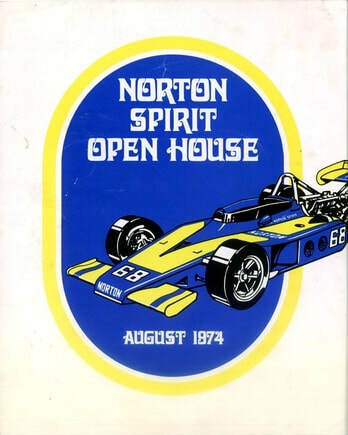 The Eagle was normally a backup for Hiss, painted in the Norton Spirit colors, and numbered #68. 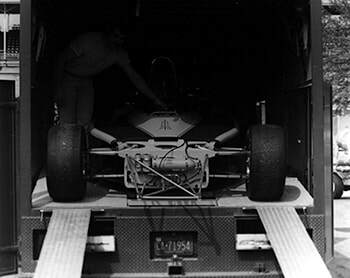 From there, all records indicate that the chassis sat around during 1975. It would be a tragic year at Penske Racing, as a practice accident in preparation for the Austrian Grand Prix resulted in a cerebral hemorrhage for Mark Donohue, who had returned to racing in late 1974 in hopes of developing the Penske Formula 1 car. Mark died on August 19, 1975. Today his son David can be seen on the tracks of the Grand-Am series, always near the front. 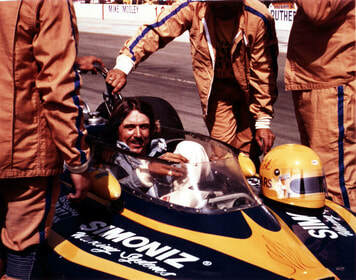 At the start of 1976, safety king Bill Simpson decided to return to the driver’s seat in a team organized by himself. He purchased #7225 from Penske in hopes of a strong 1976 racing season. Simpson, who to this day is a worldwide leader in motorsports safety equipment with his Impact brand, ran strong all month practicing for the 1976 Indy 500. Unfortunately, a warm pole day meant that the one-car team would be vulnerable of being bumped out of the event during the second weekend of qualifying, as Simpson would be back home in California managing his growing business. As things would turn out, Wisconsin’s greatest import, David Hobbs, bumped Simpson’s dark blue and yellow #38 Nikon Camera entry out of the starting field, prompting Simpson’s outfit to start preparing for the upcoming event at Milwaukee Mile. On June 13, 1976, Eagle #7225 raced at the Milwaukee Mile with Bill Simpson driving. It would be the car’s one-and-only appearance at the track, and it fared well. A total of 25 cars came out to the Fair Park on June 12, yet only 21 managed to make speeds credible enough to garner a spot in the field. From the 14th starting position, Simpson put his head down and ran a very respectable race, finishing 8th in front of 33,760 fans. The rest of the 1976 was erratic for team, as a gearbox failure at the Pocono 500 was followed by an engine failure in qualifying for the July 18th Michigan 200. 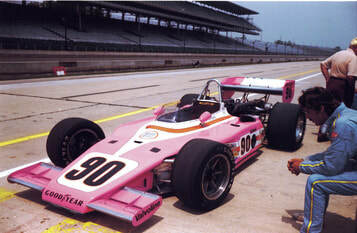 Simpson was able to persuade the Leader Cards team to lend their backup ‘72 Eagle to Simpson for the race, as there was not enough time to swap engines. Bill managed another 8th, a fine performance from 20th in an untested car. A 12th-place run at Texas World Speedway was followed by a 14th at Trenton, NJ. It was then that Bill received a call from a man from Ontario, Oregon named Art Sugai. Art was a long time car owner in the North West, owning jalopies, super-modifieds, stock cars, Formula 5000’s, and even a Vollstedt Indy car that Canada’s Frank Weiss had been driving in early 1976. Sugai had heard that Simpson was going to take delivery of an ex-Penske McLaren, and thus wished to purchase Eagle #7225 in hopes of making the upcoming Ontario 500. It would have been an easy sale, but Simpson had hopes of entering a second car for a driver he had been running in Formula 5000 named Rick Mears. A deal was made where Simpson would enter the car for Mears, a process that had him put up his house as collateral to USAC in case of an accident on the rookie Mears’ behalf. Sugai’s squad would maintain the car that week, and Simoniz Do-It Wax Systems came aboard to sponsor the car for a one-race deal. The team’s game plan was to out-live the rest of the field, as they knew that with an older car and a brand new driver, the chances of out-running the pack would be far-fetched. 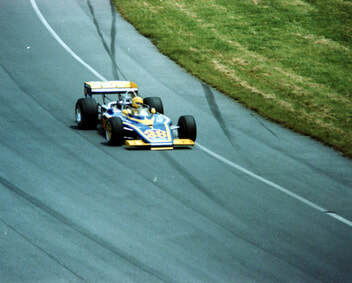 In the end, Rick Mears placed 8th in his first Indy car start in a field of thirty-three. His boss for the weekend, Simpson, led his only two career laps that day, finishing 14th after a hose failure. From that point on, Eagle #7225 was property of Sugai Racing Enterprises. 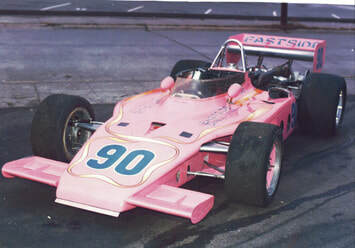 Art, the team principle, had always made it a tradition to have pink racecars and name them “The Pink Lady.” For the following race at Texas World Speedway, the car was painted in a modest pink and renumbered #90, for a strong 9th place effort. At the season ending event at Phoenix, Mears again placed 9th, earning the Wichita, Kansas born racer the USAC Rookie of the Year honors. During the off-season, Sugai picked up a second car, Eagle #7207 from Jerry O’Connell’s Shamrock Truck Lines team. This car would be used as a backup car for the following racing season. As 1977 came into view, Eagle #7225 was now a relatively old car. Only four 1972 model Eagles made it into the 1976 “500,” and things weren’t getting any quicker for them. The first race of the year at Ontario, California saw a burned piston halt Mears’ progress through the field. At the following race at Phoenix, Mears was unable to get the car up to speed to make the event. Things didn’t improve at Texas World Speedway the next weekend, as the #90 Eastside Café entry lost a wheel on the very fast banked-circuit. All of this lead up to the Indianapolis 500, a place where team owner Art Sugai looked to become the first Japanese-born team owner to be included in the starting field. The team arrived at the track in the middle of May in hopes of getting not one, but two cars in the race. The cars were repainted for the event in a bright pink with white and orange accents. For many, the scheme was accepted as a thing of beauty or hard to look at. Belgian Teddy Pilette piloted the team’s second car, #91. Both cars lacked speed during the month, as they had predicted that they could get into the field on a setup that was conducive to enduring 500 miles, as opposed to 10 miles of qualifying. A total of three engines were torn up between the two cars, and neither car made a full qualifying attempt. 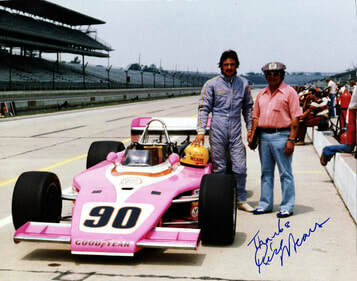 Many people, to this day, do not know that Rick Mears’ first foray at Indianapolis ended in disappointment. Yet one can only wonder what would have happened had the eventual 4-time Indy 500 champion had he made the field and run as a back marker in his first attempt. For the following race at Milwaukee, Mears left to join Teddy Yip’s squad, fully equipped with the McLaren car that Simpson had bought to replace Eagle #7225 the previous season. As history would have it, Rick Mears never raced a car that wasn’t a Penske car at some point in time. Following Indy, Eagle #7225 sat for nearly a month until the Pocono 500, where Steve Krisiloff piloted the car before yet another piston failure. The following weekend, Eagle #7225 raced at Mosport, Ontario Canada in its only road course appearance. 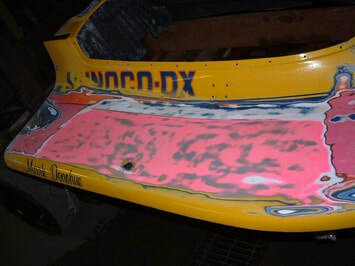 A wheel bearing failure would have the Krisiloff out of race on lap 42.Two weeks later, a strange occurrence happened to the team when crew chief Tom Fox attempted to alter the setup after practice for the Michigan 200. The remaining crew members, knowing full-well that they needed the starting money to make it to the following event at Texas World Speedway, broke into the MIS facility that Friday night, and changed the car’s setup back to one that would allow Krisiloff to make the show.Surely enough, the car managed its best result in four years, as Krisiloff brought the car home 7th. He wasn’t so lucky in the next race at Texas World Speedway though, not qualifying and losing his place with the Sugai team. 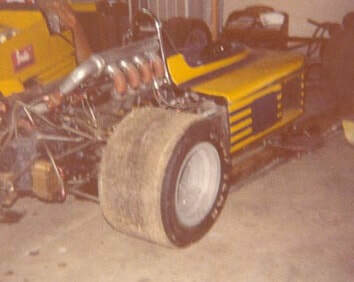 Seven weeks later, sprint car ace Bubby Jones attempted to make the next race at MIS aboard Eagle #7225, but the car was setup badly, and the Jones did not qualify. For the final event of the season at Phoenix, Jones had the car running fourth in practice, but Fox, who apparently did not like Jones, filled the car full of methanol for the qualifying attempt. Going into turn one on the first lap, Bubby nearly lost it, and the lap was for naught. Quite a way for a car to end it’s racing career. 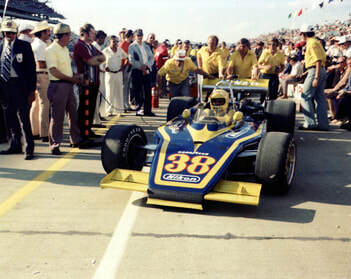 For the 1978 season, Sugai and Fox developed a new car called the Sugai Fox, which Lee Kunzman failed to make the grid at Indy. His backup car for the event was Eagle #7225, though it never appeared at the track. In 1980, race car collector Chuck Haines purchased both Eagles from the Sugai team. He still owns #7207, and it is currently displayed at the Talladega Museum, restored to its 1973 Sugaripe Prune Juice livery. In August 2004, the duo of Rick and Alison Dresang purchased Eagle #7225 from Haines, and spent the next 22 months restoring and preparing the car for the 2006 season. It debuted at the Milwaukee Mile for the June Champ Car race with team mechanic Paul Jagodzinski of Jackson, Wisconsin. driving. 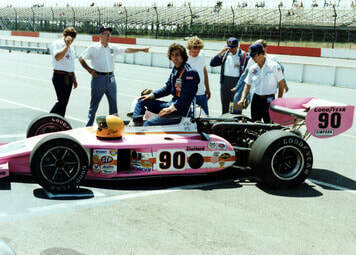 The Champ Car weekend at the Mile marked the 30th anniversary of Bill Simpson’s 8th place run at the event. The car picked up a reserved award at the 2006 Milwaukee Masterpiece Concours d'Elegance, coming in second to a 1931 Miller. It again earned a reserved award for 'Restored Racecars' at the 2007 and 2009 Road & Track Concours d'Elegance. 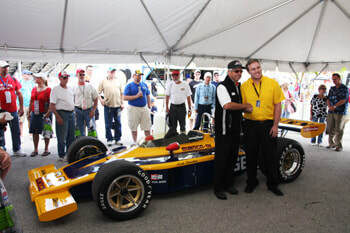 The Eagle took part in the 2007 and 2008 Rex Mays Classic held at the Milwaukee Mile racing facility, taking laps with other vintage Indy cars before the ABC Supply / A.J. Foyt 225 IndyCar Series event. Besides gleaming at some of the world's most honored tracks and concours events, Eagle #7225 has also served as a showpiece at the 2009 and 2010 Mark Donohue Tribute Reunion held at Watkins Glen International and Road America and at the 2007 and 2008 A-1 Swap & Shop shows, where the car was shown to help raise money for local teen scholarships. The car's restoration and presentation are in honor of every driver, team and fan that ever graced the car during its lifetime. It is KMPR's honor to share the car and the memories it has created with the world.